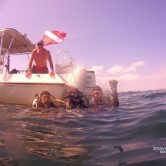 June, 2019 – PADI Wreck Diver Specialty Certification Class. Prerequisites: Minimum age of 15 and Advanced Certification. Cost: $425: Includes book and certification card for PADI Wreck Diver Specialty and dive charters. Diving submerged wrecks is exciting and rewarding requiring skills beyond basic scuba to do so efficiently and safely. The Wreck Diver Specialty certification course is designed to train divers how to research and evaluate wrecks, develop practical knowledge of wreck diving, and how to plan, organize and make wreck dives and penetrations. This course entails two classroom sessions and five dives. Students are expected to provide their own personal dive equipment suitable for each dive. In addition to normal scuba equipment and appropriate exposure protection, students are expected to have: 2 dive lights, a penetration reel, a line spool, a lift bag, a safety sausage, slates, appropriate knife/line cutting tool and redundant air supply (i.e. pony tank & regulator). These items are required for this class……We recommend you purchase these items but they are available for rent from the shop. Attendance is mandatory for all classes and dives. Classroom #1: Thursday, June 6: 6:30 pm – 8:30 pm. Meet the instructor and review course and equipment requirements and schedules. Classroom #2: Thursday, June 13: 6:30 pm – 8:30 pm. Turn in all paperwork, go over knowledge reviews and practice reel techniques. Saturday, June 15:Wreck dive 1: Navigating a wreck and running a reel. Saturday, June 29: Wreck dive 3 & 4: Navigating a wreck, use of penetration reel, evaluating & mapping the wreck, and penetration. Enrollment is Limited! REGISTER and STOP IN TO THE STORE TO SIGN UP AND PICK UP YOUR STUDENT PACKAGE!